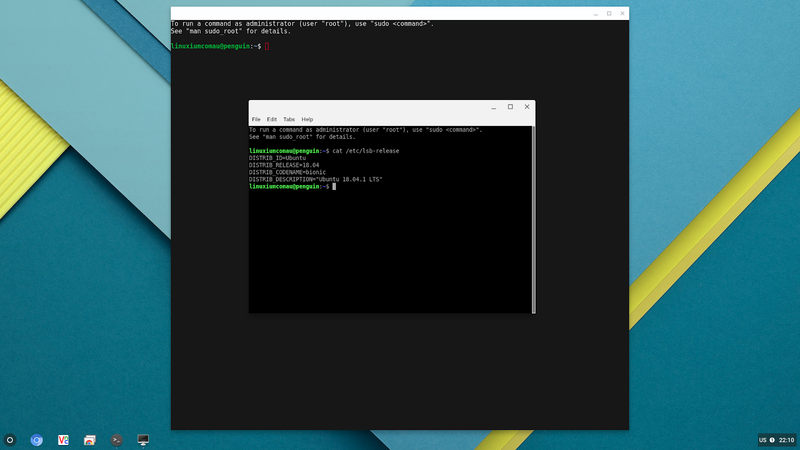 When starting the default Crostini container Debian 9 (stretch) is run. Whilst you can add containers of other distros it is also possible to change to default container to Ubuntu or even potentially other distros. This is because all the Crostini/Chrome integration packages are publicly available as '.deb' packages. The process for creating an Ubuntu default container is quite detailed but essentially consists of creating an Ubuntu container, preparing and then adding the Crostini packages, setting the hostname and user account, optionally installing additional packages. 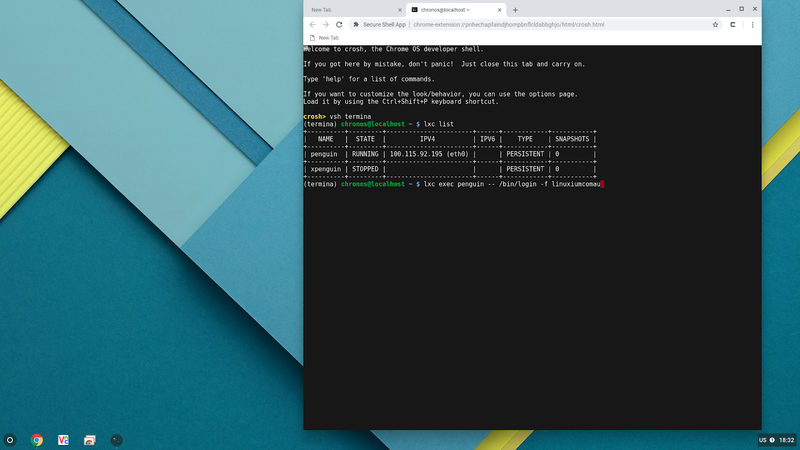 Then if the Ubuntu container has been built on a different Linux machine export the container as a compressed tarball, copy to the Chrome device and import the tarball as an image. Finally move the current default container sideways and replace it with the new Ubuntu container. The Crostini packages need a preparatory step as although they install without issue on Debian, with Ubuntu there is an installation issue with the 'cros-ui-config' package that needs resolving first. The following commands detail the actual steps required. 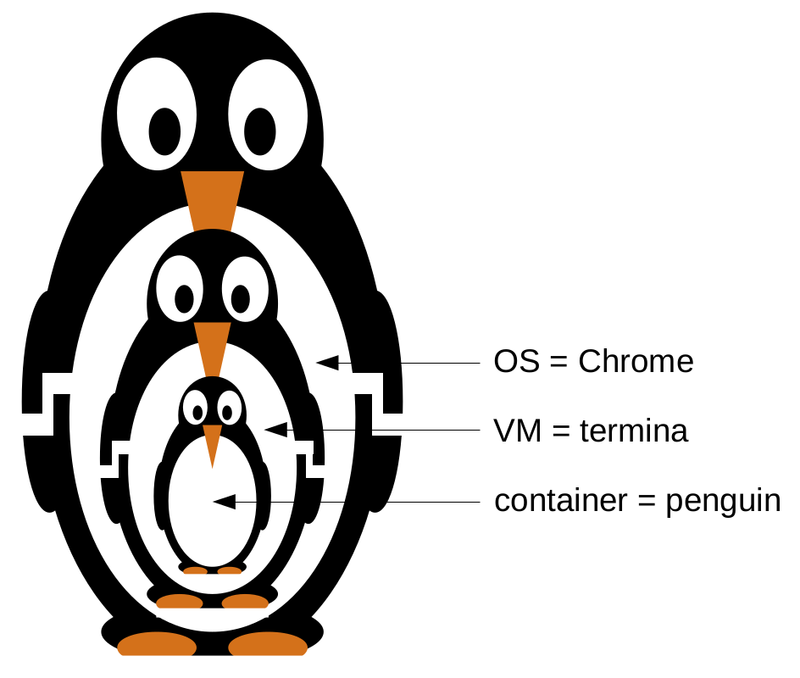 Now reboot and try running the terminal to start the 'penguin' container. If Linux fails to start check container status with 'lxc list'. 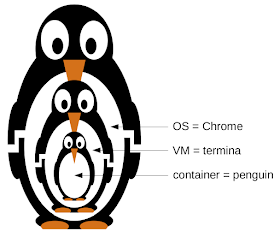 If it is stopped then start the container with 'lxc start penguin'. 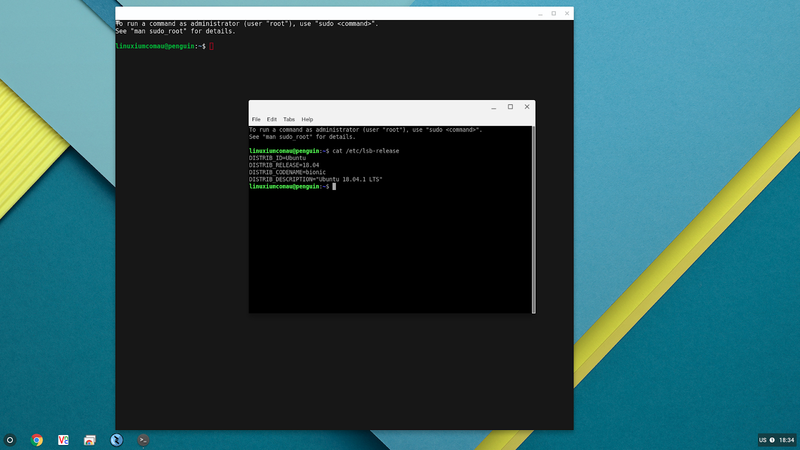 Then login as 'linuxiumcomau' with the command 'lxc exec penguin -- /bin/login -f linuxiumcomau' and this should startthe terminal. Thereafter is should function as normal. 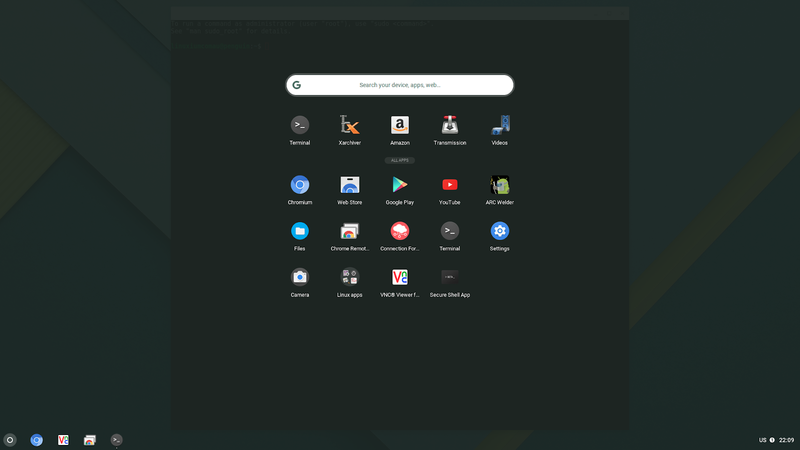 Currently the icons for Linux apps are jumbled in with the Chrome applications however this will change in the next release (see below). 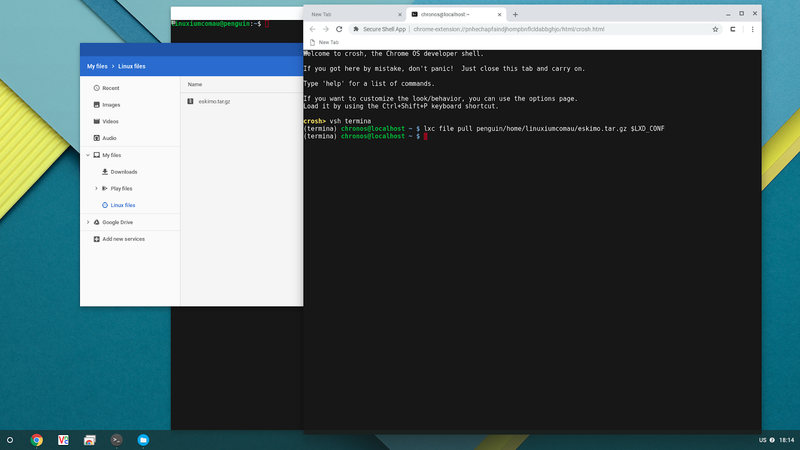 Also the Crostini integration relies on Chrome APIs (most likely OAuth 2.0 client IDs) which means that the integration on Chromium OS will fail if they are not included (e.g. the build I provide in Part 2 or the current CloudReady image from Neverware). because this is a feature of using the Crostini/Chrome integration. Where USERNAME is your username you set in the previous step. Behind the scenes this start garcon and sommelier as your user when the container boots so they are already running. You won't need to login via crosh and lxc and you should just be able to launch apps as you did with the Debian container. I followed your instructions for setting up Ubuntu. 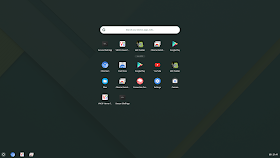 Launcher icons and browser redirects work. But Files integration gets this error - any idea how to fix it? Thanks! Nevermind, I used my normal username when setting this up, instead of my test one. Sorry! I've noticed an issue where the mouse pointer and the cursor in VS Code are very small. This doesn't happen in the default Debian container. Any ideas? And thanks for this great post BTW! The small cursor issue is seen in Firefox too... any ideas how to fix it? I tested Debian and there was a regular-sized cursor. I've had a look and I can't see any difference between the official Google Crostini container and one built based on Debian stretch and the concepts in the post above (i.e. the Crostini packages all install without any modification required). I also don't experience a small cursor either in the self-built Debian container, the official Crostini Debian container or the above built Ubuntu container (with desktop packages added) so maybe VS Code alters a default somewhere? VS Code's cursor is normal-sized in the official container. 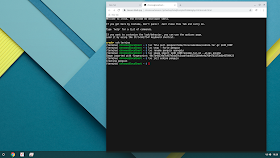 My Ubuntu container is relatively new (built since 69 went to beta on the Pixelbook about a week ago). I have a backup of an Ubuntu container I created some time ago, I'll try that and report back. 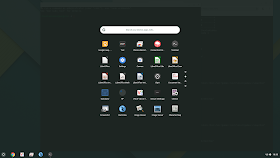 Having the same issue with graphical (X) apps in both my Ubuntu containers (but not in Debian). My Pixelbook has a fairly high-res screen, could that be the cause? I've tried those things, and they affect text sharpness and resolution, but not the mouse pointer size. 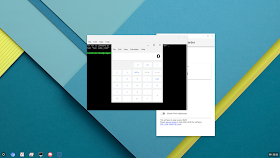 It's odd, when the pointer is in the graphical program (Firefox, code, Chrome, etc) it is tiny, as soon as the pointer moves to the title bar or otherwise outside the program window, it reverts to a normal ChromeOS pointer. Would you add installation of adwaita-icon-theme-full to your instructions please? before the key import to ensure the matching cros binaries are selected. 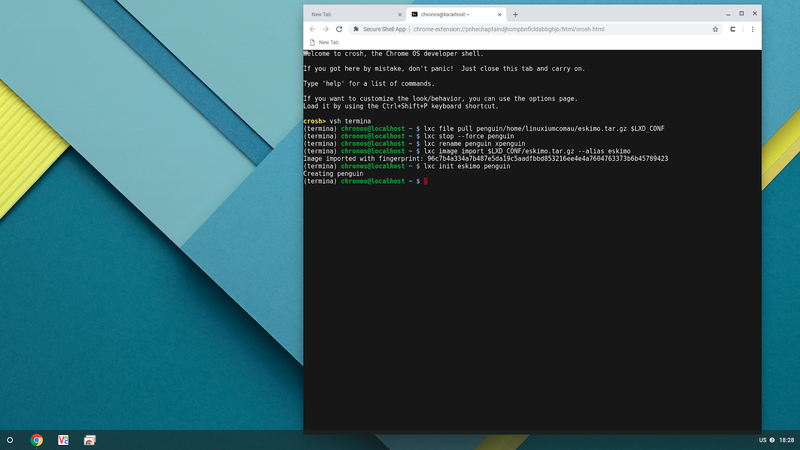 If you have a previously build container and are now on a later version of Chrome OS (i.e. 70 or later) you can update simply by running the line as a command and then running 'sudo apt update' followed if required by 'sudo apt upgrade'. However judging from the thread this may break again in the future if 'cros.list' is indeed removed. I've looked at this and at this stage it may be better to manually update from 70 -> 71 etc. as things are rather fluid with development. I'll keep and eye on it in the interim. Note with release 71 there is a new 'cros' binary that gets installed: cros-notificationsd. I'll update the instructions when release 71 hits the dev channel. Cool thanks. Did you see my fix above for small cursors? Yes. 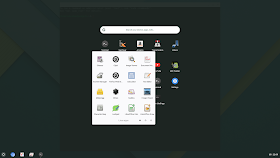 Is it because you are not installing the full 'ubuntu-desktop^' package that you get this issue? adwaita-icon-theme-full is actually installed in Google's Debian distro, although you can't see it with apt under Debian. Hi, thanks for the guide! Now if I want to make some space and delete what I created, what should I do? Sorry, found the command already. Lazy me! Is breakage expected when Google updates Crostini? To answer my own question, I reviewed the list of packages that Google installs in the Debian container: ` dpkg -l 'cros-*'` Then for each package, I used `dpkg -L packageName` to review the list of files in each package. Would I found is that Google installs surprising little in the containers to accomplish the integration. If this trend continues, it seems likely Ubuntu-compatibility will continue to hold. That doesn't seem to get installed even under Debian, correct? So how does it get installed? I don't think it does get installed. I think it can be ignored for the time being. 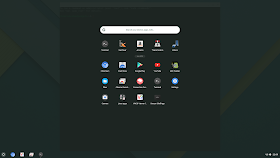 I've gone through the guide and I have the folder of linux apps but none of them actually load they just act like they are loading perpetually. Where did i go wrong? Try rebooting your device. Sometimes the VM seems to hang. I looked into this when it first appeared and I agree that users don't need to install or run them. I updated to CrOS 73 and went fine. You still need to `apt install` your repackaged cros-ui-config package. I've updated the post above accordingly. I love getting a full desktop thru vnc but I can't seem to get any other desktops working besides LXDE. 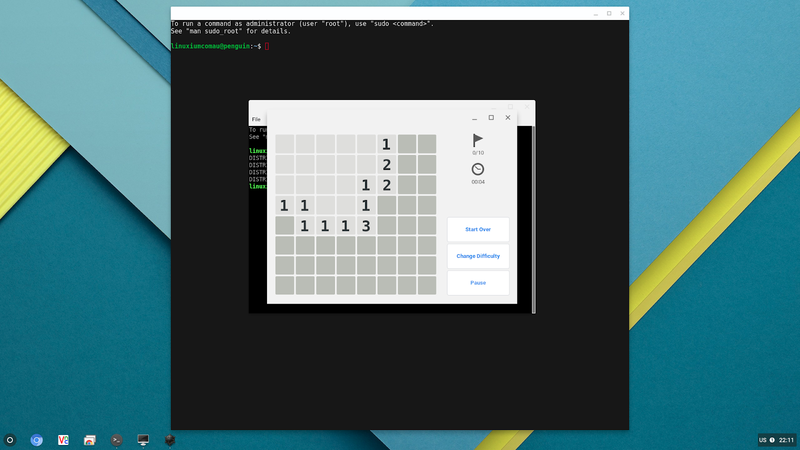 I've tried editing ~/.vnc/xstartup with gnome-session, unity, etc. to no avail. I hope I'm just missing something simple. 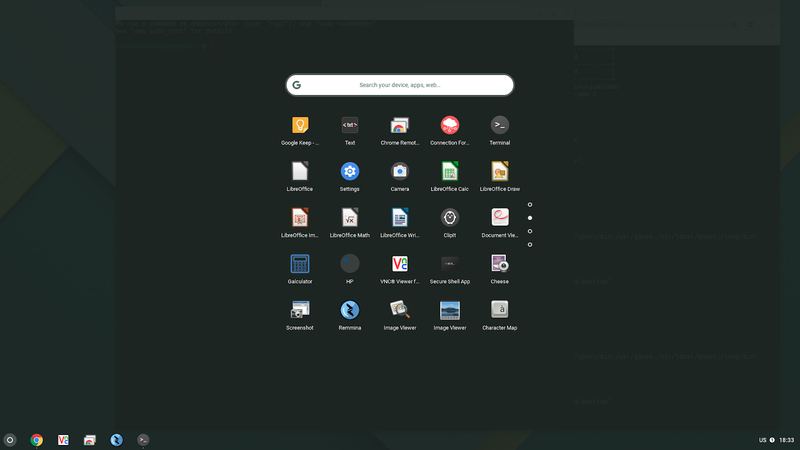 I've also never got Gnome or Unity to work and always use LXDE. Why did you take this stuff out? It had become outdated to the point of being wrong and I found that everything worked without the modification. So rather than update to the correct sed commands I deleted it. Would it work to simply copy the GTK3 version over the Google version, rather than use sed? By not using 'sed' you end up using the Ubuntu version rather than the Google version which seems to work fine. This is the closest I've gotten to getting Ubuntu running straight up. I can do the exec and log into the ubuntu container but if I try to click the "Terminal" icon, first time ( when the container is stopped ) the status arrow swirls, then quits. After that, it never seems to do anything but I can exec bash in Termina and connect though.